As we’ve discussed, the Fall 2014 iteration of Couture Week is underway in Paris as we speak. The world’s top fashion houses—everyone from Dior to Versace to Giambattista Valli—are showing the best of what they have to offer. This often means sending creations down the runway that, on the surface, might seem to be a totally out-of-this-world fantasy. After all, what good is a one-of-a-kind silk-organza gown embellished with 350,000 Swarovski crystals to girls who need real clothes to wear from day to day? We’ve got five really good reasons you should absolutely care about (and pay attention to) Couture Week. Scroll down to learn why you should keep the annual fashion extravaganza on your radar! 1. The trends trickle down into ready-to-wear. First and foremost, the most important reason any fashion fan should keep one eye firmly planted on Couture Week: the trends trickle down into the clothes we all end up wearing the next season. 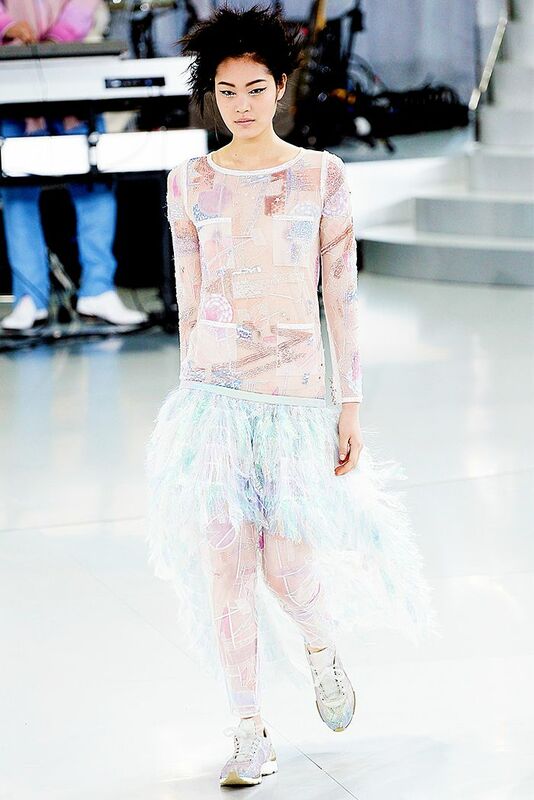 A prime example: during their Spring 2014 Couture show in January, Chanel set the stage for two huge trends to really take off on the ready-to-wear runways in February: sneakers and iridescent fabrics. Now, you can see these statement pieces on fashion editors, bloggers, and cool girls alike. 2. Each piece is a completely one-of-a-kind, hand-crafted creation. Whether it’s an extravagant ball gown or an ultra-sleek and modern pantsuit, each couture piece is a completely one-of-a-kind creation. Unlike ready-to-wear shows, which preview clothing that will be available to shop and purchase as-is ahead of the season, couture pieces are not up for grabs for retailers to put on their racks. 3. Couture Week is what predicts the next red carpet season. There’s a reason you see so many Hollywood It-girls—Jennifer Lawrence, Charlize Theron, Kristen Stewart, and the like—sitting front row at couture, but not necessarily attending the ready-to-wear shows. Fashion-forward celebrities and their stylists “shop” the collections for the upcoming red carpet season. For this reason, the dresses that walk down the couture runways each July often make their next public appearance at the Emmys, Oscars, or other big-time award shows. 4. They set the tone for how heritage brands will evolve toward the future. Many of the brands that show couture collections have been around for decades—Dior was founded in 1946, for example—and in the ever-changing world of fashion, it can be a challenge to stay true to the house’s core values. The couture shows often set the tone for how these brands will continue to keep up with the times, while also paying homage to their roots and heritage. 5. It’s an important piece of fashion history. One really cool, little-known fact about couture: it’s an art form monitored and curated by the Paris Chamber of Commerce. In order to produce a collection officially deemed couture, you must belong to an organisation called the Chambre Syndicale de la Haute Couture. The only official members to date are as follows: Adeline André, Gustavo Lins, Chanel, Christian Dior, Christophe Josse, Franck Sorbier, Givenchy, Jean Paul Gaultier, Maurizio Galante, and Stéphane Rolland (above). The other labels who show during couture week—like Versace, Elie Saab, Valentino, and even Giambattista Valli—are technically deemed correspondent or guest members, meaning they are granted permission to show, but are not yet official members. Scroll down to see pieces from all the official members of the Chambre Syndicale de la Haute Couture!